Finding school assembly ideas can seem difficult. You need to make sure that the students are thoroughly entertained, but they also need to learn something meaningful as well. You also want to make sure that your teachers find this time away from class valuable and not just a giant waste of time. There are many points throughout the school year where a school assembly can tie in very nicely to what the school already has going on. An assembly can be nice compliment or add-on to a program or theme that the school is already promoting. Below are 25 school assembly ideas that you can organically incorporate into your school theme, culture, and calendar. Elementary students getting excited for a school assembly. Most schools schedule several assemblies throughout the year. There doesn’t need to be a special occasion for kids to have fun and learn something. School assemblies are often sponsored by the PTA, PTO, or cultural arts committee. The goal is either to expose the kids to something they normally wouldn’t see in the classroom or to bring something to life that they learned about in the classroom. Traditional school assemblies can cover curriculum (math, science, reading), the arts (dance, theater, music), or character education (anti-bullying, kindness, character-building). There is never a bad time to host a school assembly, and you don’t need a special occasion. School assemblies are a great way to introduce the Buddy Bench. Buddy Benches are becoming quite popular these days. I’ve noticed that schools have been hosting all-school assemblies to introduce the concept of the buddy bench. 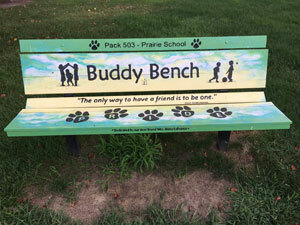 Having an outside speaker or entertainer come into your school to talk about the buddy bench is a great school assembly idea. Your students might want to use the buddy bench, but they might not have the courage or motivation to do so. A school assembly can be effective in motivating them to sit down next to another student who is being left out and use the Buddy Bench. Every school has a theme for the year. This theme is everywhere. It’s on shirts, in the hallways, and even on the school marquee out front. But how do you get the kids to buy into this theme? 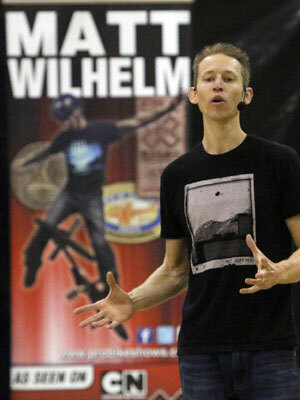 An exciting show that incorporates your theme is one of the best school assembly ideas. Your school theme will get some major cool points when students see a fun show that includes the theme and many of the key ideas. The theme will come to life as students see a real life physical example of the theme at work. 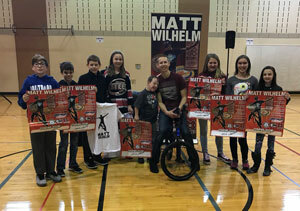 Anti-bullying speaker Matt Wilhelm at a school assembly. One of the most popular school assembly ideas in the country right now is hosting a bullying prevention assembly. In fact, some states require bullying education by law. Assemblies are perfect for setting the tone and the culture of the school. A proactive approach to bullying, like hosting an assembly, can reap rewards down the line and stop issues before the arise. Plus when parents complain or ask what you are doing to address bullying, you can point to a concrete example of bringing in an anti-bullying assembly. School assemblies can be a huge piece of the puzzle in reducing bullying incidents at your school. Let’s face it, by the end of the year the students are done. Grades are in, testing is over, and those hot summer days can lead to some unruly classrooms. Why not have a school assembly on one of the last days of school to close out the year with a bang? End of the year school assemblies are good for not only eating up some classroom time, but also letting the kids blow of some steam. Hosting a character-ed or anti-bullying assembly at the end of the year is one of the best school assembly ideas because the kids will be learning something at a time when they would normally be checked out. School assemblies are a perfect way to wrap up field day. Hosting a show on field day is another popular school assembly idea. There are a few different ways to use an assembly on field day. You can have an all-school assembly in the morning to kick off the field day activities. This can be a great idea to unify the school and set expectations for the day. You can also end field day with a show. This tends to work nicely as the kids have been running around all day and are probably exhausted by this point. Having a show at the end of the day where everyone can relax can be the perfect ending to a successful field day. You can also integrate the show throughout field day. Many schools have different stations that kids visit during the day (water balloon toss, games, inflatables, etc…) You can hold several performances throughout the day, and the show will simply serve as one of the stations. This will not only give the kids a break during the day, but it will also give them a chance to learn about a relevant topic the performer can tie in as well. October is National Bullying Prevention Month. Founded by Pacer’s National Bullying Prevention Center in 2006, individuals and schools unite to keep students safe from bullying. 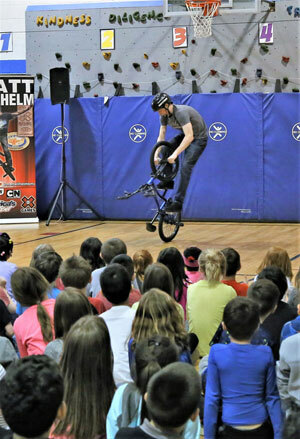 The school can hold various activities throughout the month, and bringing in a show can be one of the best school assembly ideas. Students in the kindness club. One of the newest school assembly ideas is to organize a kindness challenge. These challenges usually take place over the course one week. Activities are held throughout the week to promote kindness and get kids in the habit of acting kind toward one another. One of the best school assembly ideas for this week is to have an assembly at the beginning of the week to kickoff the kindness challenge. You could also have an all-school show at the end of the week to wrap up the kindness challenge. Schools often have some kind of positive behavior reward system in place. When kids do something right or are caught being good they earn tickets (often called paws or named after the school mascot like Eagle Bucks). These tickets can be redeemed at the school store for prizes. 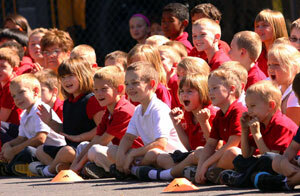 You can use a school assembly as a reward for positive behavior. Students who earned a certain number of tickets can attend, or students who did not get a major referral can attend. You can set up the attendance requirements however you see fit. Plus the performer’s message can probably tie in very nicely to whatever your school-wide behavior traits are, which further reinforces your school-wide behavior system. 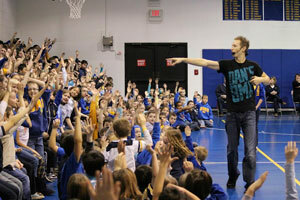 Positive behavior reward assemblies are quite common and becoming even more popular. For more information on PBIS click here. Introducing these character traits at the beginning of the year is crucial. However introducing PBIS ideas can sometimes come off as boring to kids. Why not bring in an outside school assembly performer to make these values cool? PBIS kickoff assemblies are most common during the first few weeks of school. Meeting with VIP students for autographs after a show. How do you motivate the kids to help out in the school fundraiser? Let’s face it, many of the kids already have iPads and video game systems at home. So winning a cheap plastic toy imported from China for selling five items is not going to motivate them one bit. This is where bringing a show into your school can really boost your fundraising numbers. Investing a little bit of money into your fundraiser can have a big payoff. The kids will get an exclusive show, which is something they can’t get anywhere else. Plus, older students get what they covet most… getting out of class. You can layer your fundraising show with different tiers or VIP levels. If they sell “X” amount of items they can sit in the VIP section or front row. They can also do a meet and greet / autograph session after the show as well. Fundraising rewards are one of the best school assembly ideas. Walkathons, fun runs, and other pledge-driven fundraisers are becoming popular with schools. Fundraising with walkathons is easy because there is no product to sell, backbreaking delivery, or complicated billing system from fundraising companies. Why not end your walkathon with an exciting show? The school (and often parents) are already gathered together outside, so it’s very convenient to wrap up the event with an outdoor all-school show. Assemblies are a great way to motivate students for standardized tests. Having a school assembly in the days leading up to the tests can be a huge motivator for students. Seeing the school rally together for something bigger than themselves will give students purpose and give the test greater significance. Having an assembly revolving around a theme like “Do your best on the test “can make students want to try just a little bit harder, which can make a huge impact on test results. Another idea is to hold an all-school assembly after the standardized tests are over. During testing you can promote the show with a phrase like “Only 3 more days until the big show.” It will bring a sense of excitement to the air during a time that can be very grueling for students. Getting the students excited in the middle of winter. Winter burnout is real. Toward the end of January through February students can get sluggish. It’s dark when you wake up, dark when you go to bed, and there aren’t many bright spots. A thrilling show can bring some excitement back into school and get the kids charged up again. After a show in the middle of February it is common for a teacher to say, “This was the perfect time of year for your show.” School assemblies where the students walk away motivated and inspired are particularly effective during this time of year. During Red Ribbon Week schools all across the country celebrate being drug free. This week is typically held during the last week of October. The topic of drug awareness can be tricky to teach in the classroom. It’s often best to bring in someone from the outside, like an experienced speaker or performer, to handle this duty. The benefit to hosting a school assembly during Red Ribbon Week is that you take a negative topic like drug-awareness, and put a positive spin on it and make it fun. Families are constantly looking for activities to enjoy together, but it can be challenging to find something that the whole family can do together. Booking a school show for a family night is the perfect way to bring a sense of community to your school. You can host a pizza night or ice cream social and cap off the evening with an exciting show that appeals to all ages. Hosting a family night will strengthen the bond between parents and the school. How you kick off the 2nd semester is crucial. The students can’t just be expected to jump right back into school after a long winter break. Opening the 2nd semester with an assembly is an excellent transition from vacation to learning. You can set goals for the last half of the year and remind students of expected behaviors. School assemblies are also good for developing a sense of belonging within the school. 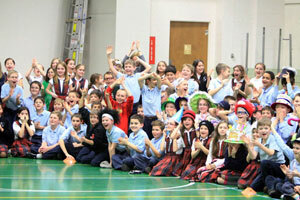 Students having fun at an assembly during Catholic Schools Week. Have you ever encountered this scenario? The parent group wants to bring in an exciting show or assembly, but the principal doesn’t want to give up valuable class time. Enter the Fun Lunch. Without any schedule changes students can watch an assembly during the lunch period. The students can eat their lunch as usual and watch the show during recess or they can eat while watching the show. This isn’t one of the most common school assembly ideas, but fun lunches can work in the right conditions. The end of the year provides all types of different occasions to bring in a school show. Parent groups often want to honor the teachers with a catered luncheon during the school day, but what do you do with the students for an hour? Who is going to watch the kids? School assemblies are the perfect idea for entertaining kids during a time when their teachers have to be away. The teachers can be enjoying a nice quiet breakfast or lunch provided by the parent group, and the kids will be having fun and learning at the same time. Make sure to get some extra parent volunteers to help with the show, as it’s usually a good idea to have a few adults in the room. Schools are getting away from hosting parties in the classroom.There is no need to pump the kids full of sugar on Halloween right before they go trick-or-treating. Students also come from different backgrounds, religions, and customs so throwing a Christmas party might not be appropriate. But you still want to do something special during these times of year. And let’s face it, focusing on a math lesson in the classroom on the afternoon of October 31st can be impossible. Bringing in an outside show is perfect for this situation. You can still do something fun and special, while appealing to the cultural norms of everybody. Booking a show for the last day before winter break is one of the most common school assembly ideas. Setting a school-wide goal of reading a certain number of minutes is great, but in order to make it work the students need some kind of big payoff at the end. They need a reward for reaching their goal. School shows are an awesome way to get kids excited about reading challenges. Not only is the show the perfect reward, but you can also promote the show during the reading challenge to keep the kids engaged. 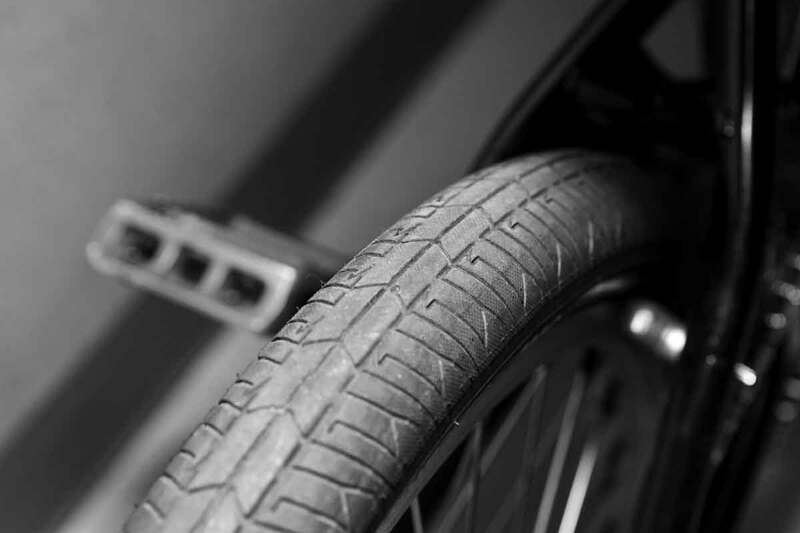 Showing the importance of bicycle safety. 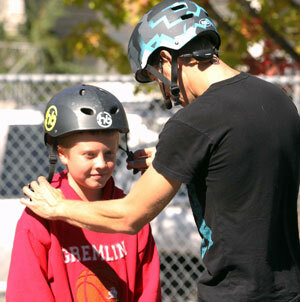 Safety days lend well to school assemblies. Students spend the day learning about railroad safety, stranger danger, bicycle safety, and fire safety among may other topics. 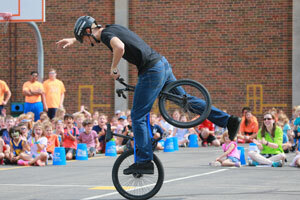 Bringing in an exciting show on safety day is one of the most popular school assembly ideas. It’s a great way to wrap up the day, while also reinforcing some of the messages. 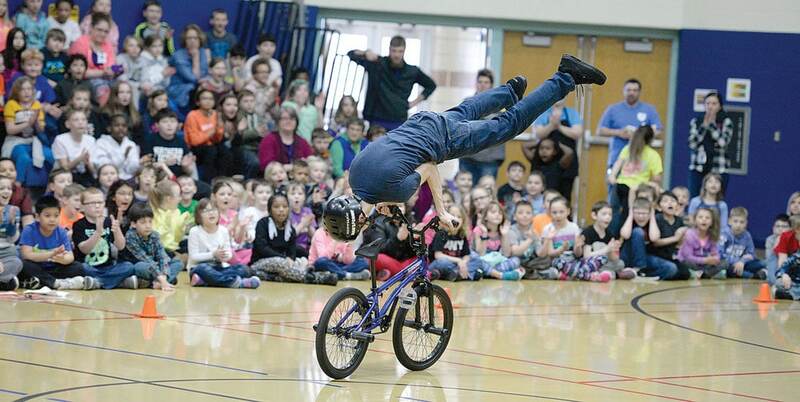 Ending the quarter with a fun show is another common school assembly idea. It’s common for schools to have themes for each quarter so this could be a great transition from one theme to another. The performer can reinforce the old theme while introducing the new theme. School assemblies are an excellent way to close out the quarter on a positive note. Starting the school year off with a bang is one of the best school assembly ideas. Shows on the first day usually take place in the afternoon (although I’ve had several schools book me for first thing in the morning on the first day of school). This can be an excellent time for the principal to address the entire school, set goals and behavior expectations for the year, and finish with an exciting show. Students will remember how fun school can be and will be eager to return the next day. You can hold an assembly at just about any time during the year. School assemblies are a great way to kick something off, reward something that students have worked for, or reinforce a theme or message that the school is trying to teach. School assemblies can bring boring concepts to life. Most importantly, assemblies can motivate students to be the best version of themselves and turn them into well-rounded human beings.